man with kite: [during the opening dream sequence while Guido floats high in the air like a kite over the beach] Counselor, I've got him. 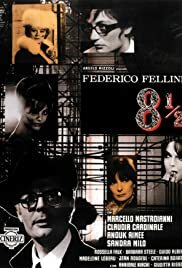 Q: What does the 8½ in the title stand for? Q: What make of sunglasses was Guido wearing? 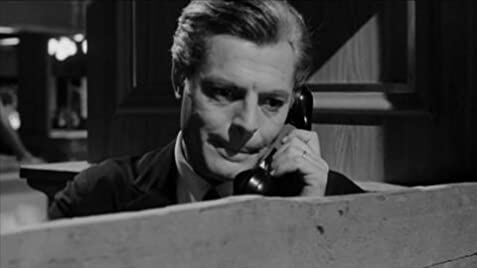 Federico Fellini gets Marcello Mastroianni to play him. Yes. Right? Of course. The artistic block is something that Fellini dealt with all his life - Orson Welles once said that Fellini was a great artist with very little to say - that's part of Mastroianni/Fellini's block - He knows where he wants to go but he doesn't know if he has what it takes to get there - then of course the the distractions or excuses whatever you prefer, they are muses, mothers, loves, wives. I was overwhelmed by the access Fellini provides to his own heart and mind and by the audacity and poetry of the film. 8 1/2 stands alone in the virtual mausoleum of world cinema.